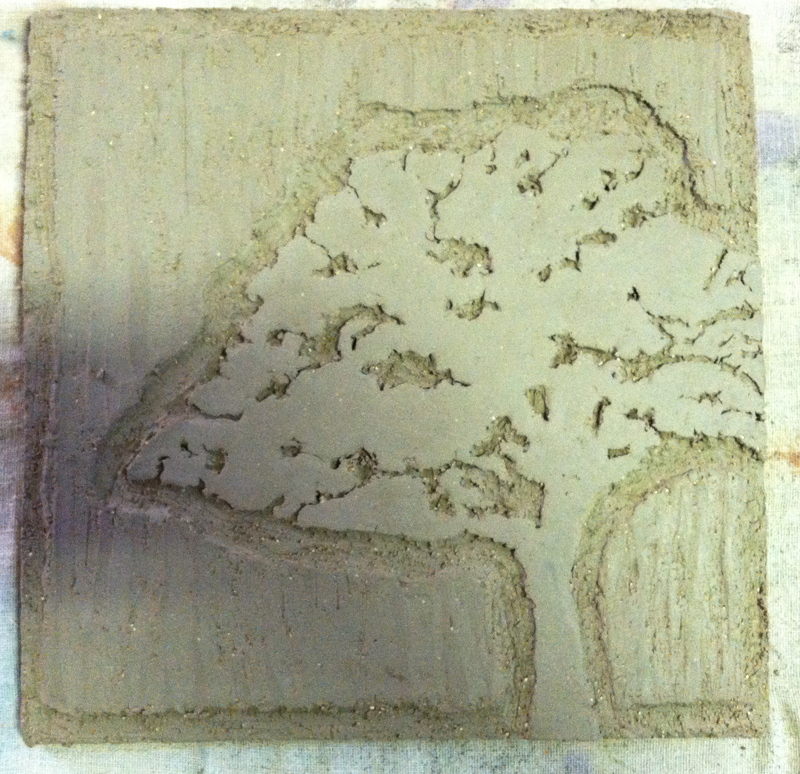 Artists take inspiration from varied sources, it is part of who we become as our work matures. Intially in our early stages of working, that inspiration may result in "copying". 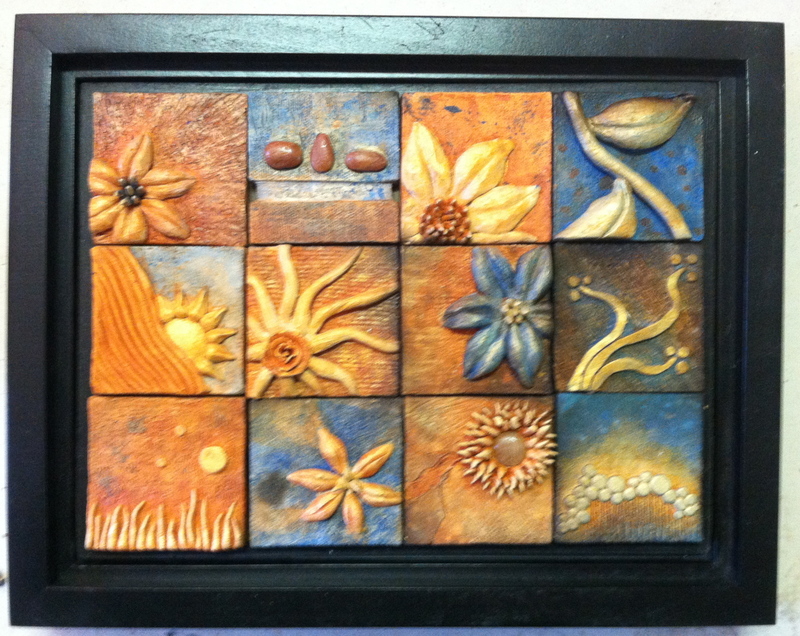 There are many new items in Studio 160 so be sure to visit Art Works Richmond to see the latest. Check it out! 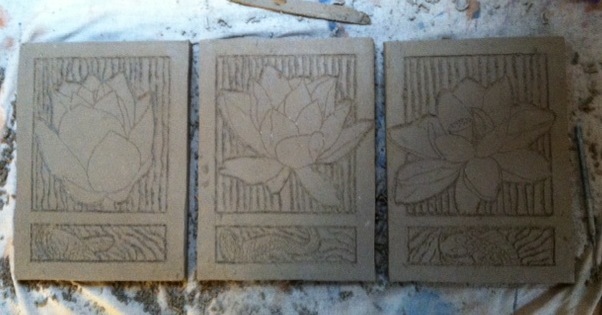 The Potter's Council 2015 Sculpture Calendar, month of June featuring my Lotus Tiles. After what seems like forever, I'm finally pretty settled in my new place. I've moved many times before but this move was really the perfect storm of a move. The worst is behind me and I'm finally venturing back into my studio. It's always so hard to jump back into work after a long time away from the table. The image shown is the first work in progress post move! These are definitely bit of a departure but I'm having fun. Here are the professional shots of the latest batch of work shot by Taylor Dabney. 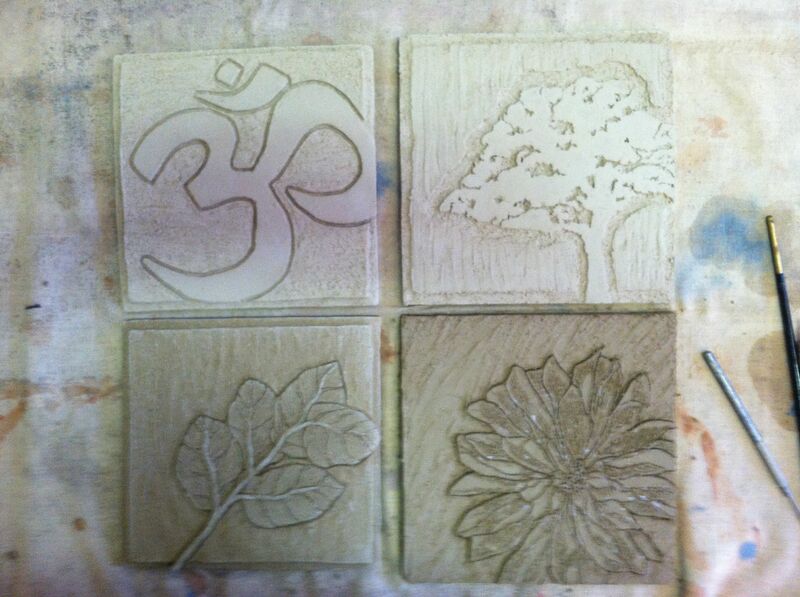 My original intent was for each of these to remain separate - mini works that I planned as prototypes for larger tiles. However during the entire process they just seemed to want to stay together. What was once separate units have merged into one piece. If you missed it, there are earlier posts that show these at various stages. 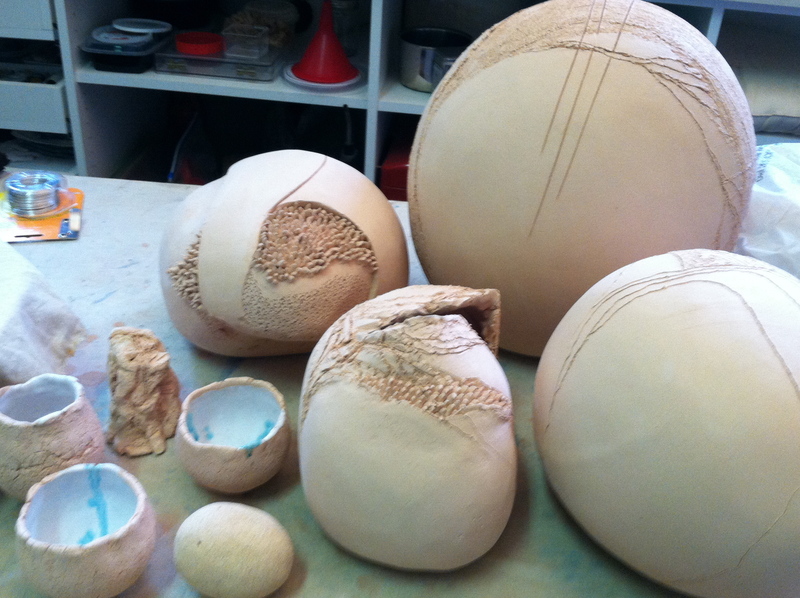 Here are these pieces straight from Thursday's firing. I haven't given them a good clean up yet so some of the carbon will scrub off when they are thoroughly washed. 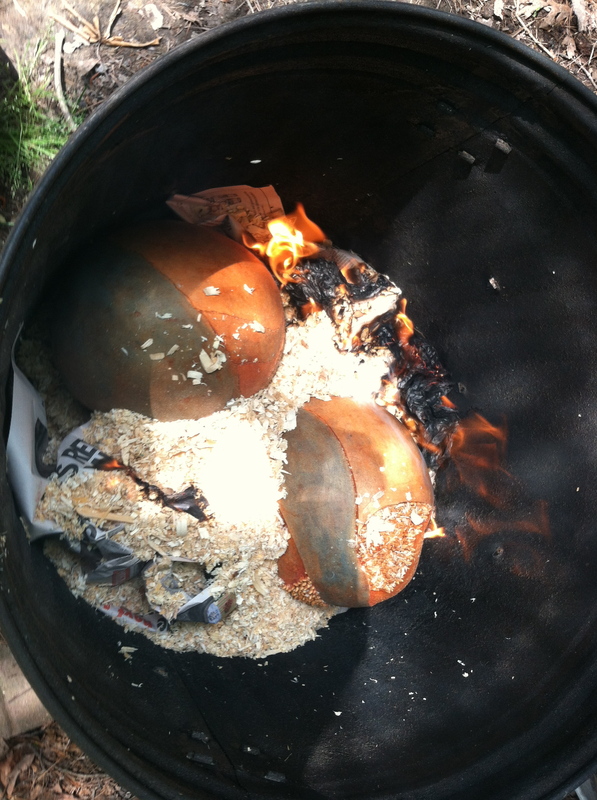 Kilns loaded with ware and firing. Sawdust and newspaper nestle around the work. 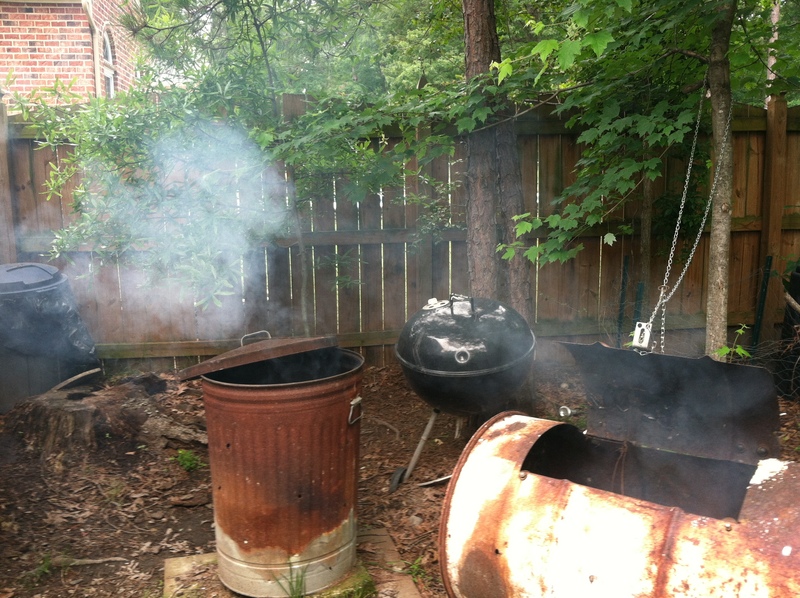 I place combustibles with an idea of where I want the heaviest smoke coverage. It doesn't always work out like I want it to but it gives me a small measure of control. 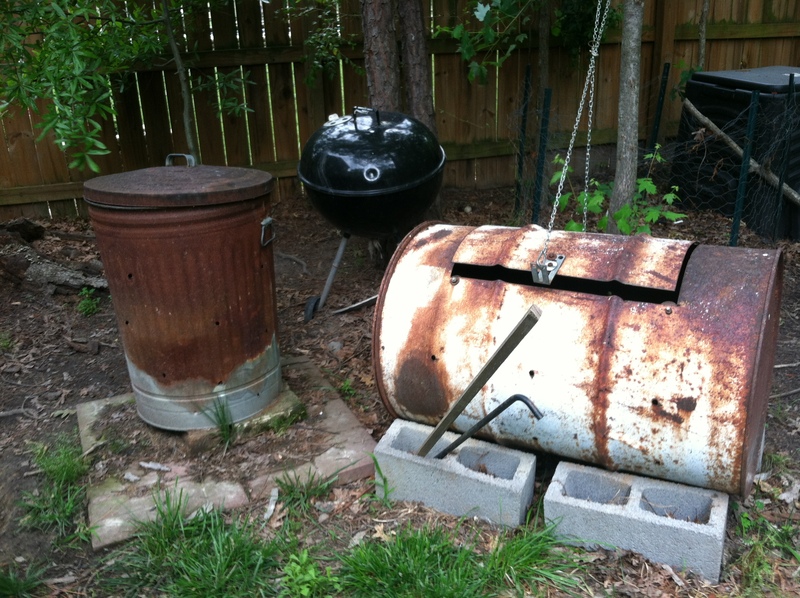 These are my oh so high-tech sawdust kilns including the kettle grill in the background. 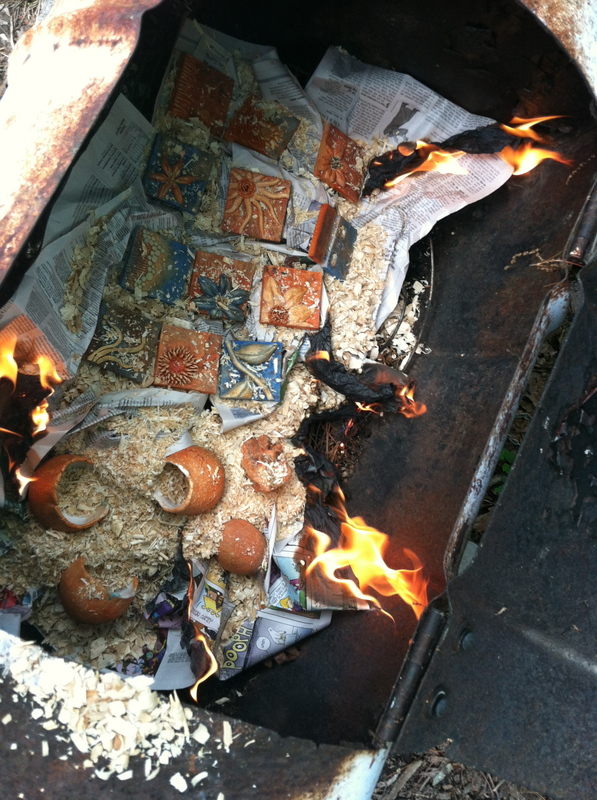 I use pretty much anything that burns but newspapers and sawdust are the main combustibles. I use acrylic stains to add color to my work. Years ago in an effort to have more time building pieces, I abandoned some traditional ceramic techniques. 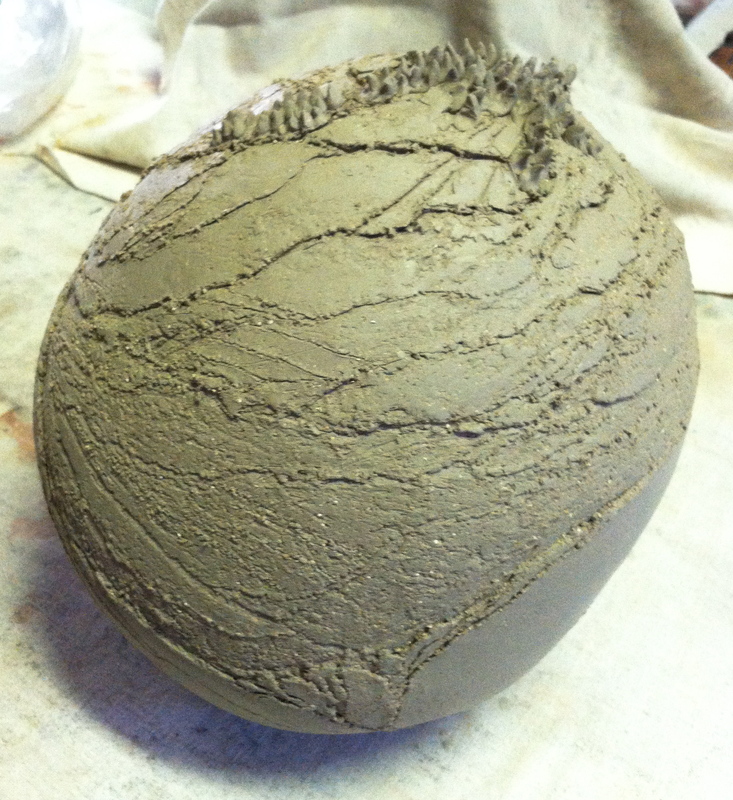 I still occasionally use glazes but since my work is non-functional I am not limited in how I finish pieces. Painting surfaces is quick and immediate and frees up more time for construction. "At our house in Georgia there's an outdoor fireplace on a sheltered porch, and I put my Franz ceramics on the mantel there. They looked really nice. 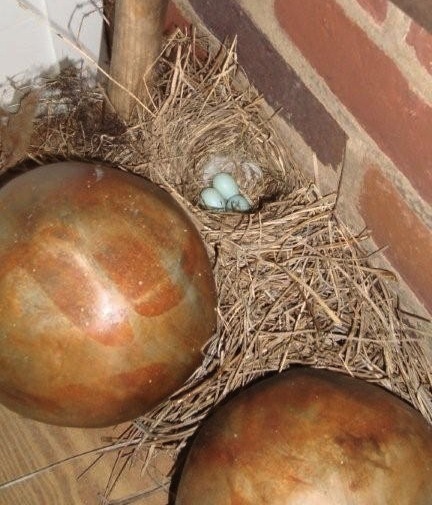 Gradually other things joined them--an old saw my son found in the woods, an old typewriter. . . . And then, possibly inspired by my large "eggs," a bluebird family added eggs of their own to the display. My son reports that the little birds have hatched and are doing well." 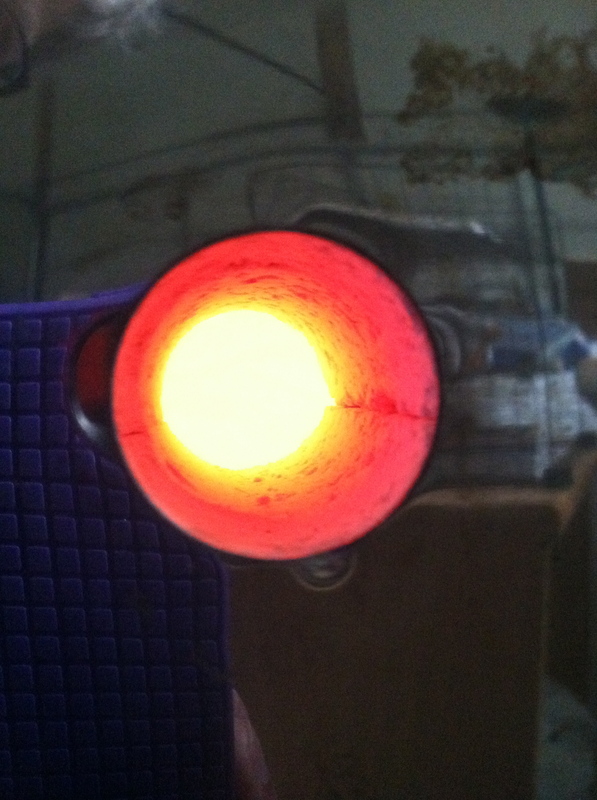 This is the kiln's porthole at 1540°F in yesterday's firing. Final temp reaches 1893°F. 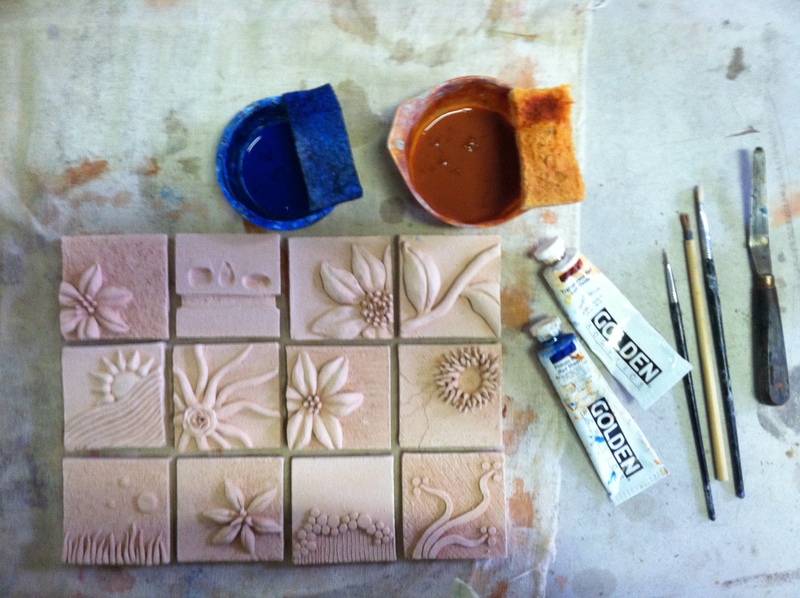 Here's some of the kiln contents ready for the next step of adding on color. 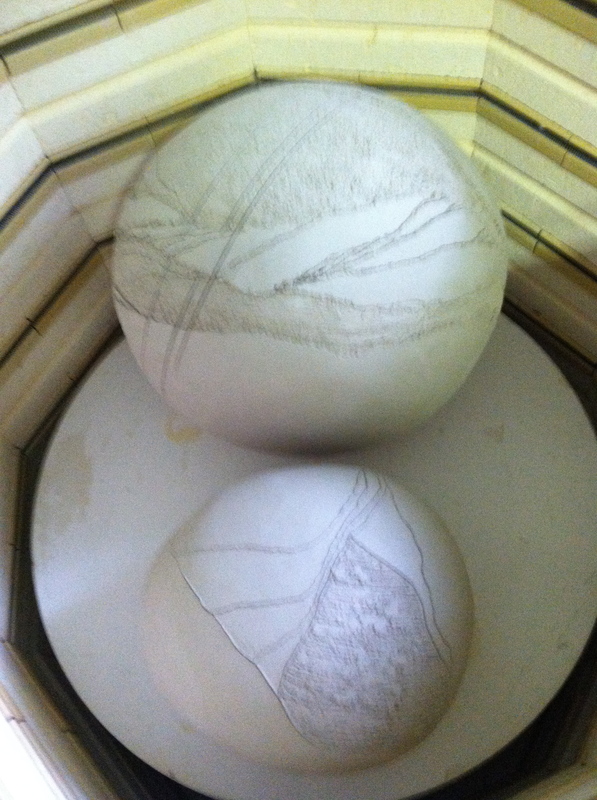 Kiln loaded and ready to fire. Chilly, damp day in Virginia...good day to heat up the garage. The kiln is great supplemental heat in the winter, not so good in July.